look forward to a relaxing lunch at their favorite restaurant - be it Italian, Continental, Japanese, or Deli - OU mashgichim are busily supervising the kitchens, making certain every delicious morsel the customers enjoy is one hundred percent kosher. to (and continue to welcome) the challenge. programs. The dramatic changes in menu prompted the OU to conduct a conference last year on the mesorah of different birds, such as quail and wild turkey - dishes just a generation ago, we wouldn't have dreamed were possible. Every mashgiach, no matter what the carte du jour (a.k.a. 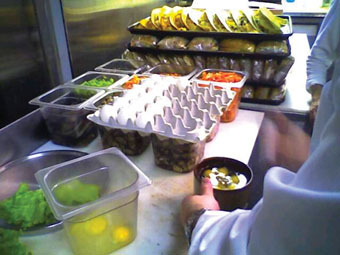 fancy food plan), monitors the entire food preparation process, checks every ingredient of incoming and outgoing deliveries, inspects and cleans insect-sensitive vegetables, cracks and examines eggs for blood spots, and often assists with inventory control and orders. Whether he is supervising a meat or dairy establishment, the mashgiach must verify and maintain a uniform and constant kashrut standard. An expert juggler, he moves quickly from area to area; sometimes the production area is not all within eyeshot and might even be on different floors and areas. The winning combination of perceptive and physical agility proves a must in quality kashrut supervision. The prevalent move toward upscale and more creative cuisine brings with it the need for a wide range of ingredients. Most chefs, no matter how sophisticated their skill set, are not trained in the nuances of kashrut, prompting our mashgichim to conduct in-depth research for comparable kosher alternative products for those used in the non-kosher recipes. Thanks to the OU's extensive ingredient department and database, all of our establishments have an invaluable resource in their search for available products. one hundred percent kosher. Betayavon! Rabbi Menachem Genack is Rabbinic Administrator and CEO of the www.replica-handbag.net OU Kashrut Division.Â Bayla Sheva Brenner is senior writer of the OU Communications and Marketing Department.